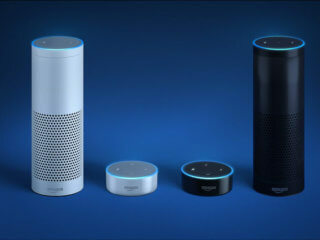 The 3D technology has for the past thirty years earned an excellent reputation for its unpredictability. There are new surprises with 3D printing technology every day. For example, who could think of a thing like Additive Manufactured Houses? Obviously, no one. But what are we witnessing today? Additive manufactured houses are a reality, all thanks to 3D printing. It is not done with 3D printing. 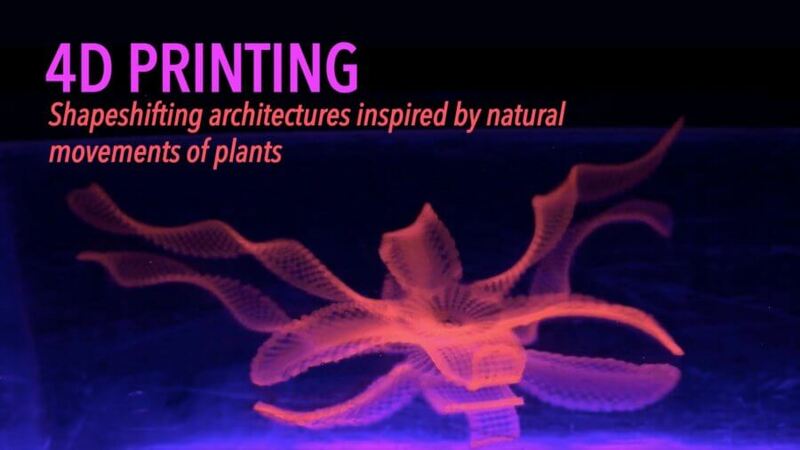 There is another enormous surprise; 4D printing. 4D printing is a product of a collaboration between MIT’s Self Assembly Lab and 3D manufacturing company Stratasys. We already know what 3D is, but what is 4D? Just it is an evolved 3D printing supplementing the measurement of time to the old 3D printing procedures. The implication of this is that, via 4D, it is possible to change the shape of the 3D printed object after it is published. The 4D printing uses a unique material which possesses a property of self-deformation once they are unprotected from environmental stimuli, e.g., heat. This Self-Evolving material has been an area of extensive research by scientists for a couple of years now. 4D printing will bring surely unimaginable capabilities in such fields which for a long time has remained very inelastic, such as in building industry, aerospace, health and in automotive. 4D printing makes it easy to programme objects to react in a particular way without the use of electronics. This will be very helpful especially in space where the environments are extreme. In building structures, 4D will contribute so much. That is the reason why the materials are doomed most appropriate for sewerage and plumbing structures. For example,4D printed pipes will adapt to the amount of water passing through it. The 4D printing technology has contributed immensely in the field of medicine. For example, to minimise the procedures involved in carrying out surgery, doctors use 4D printing to put self-transforming components into the patient’s body. Through this, doctors can then treat any abnormality. Hence, they don’t need to operate the patient to be able to access the deformed part. 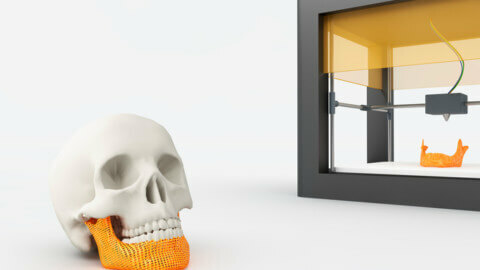 The fact that an object can transform into another different object makes 4D printing quite a fascinating thing. 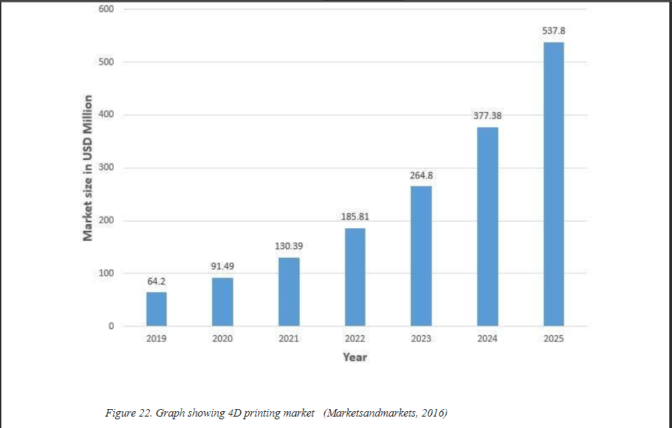 The current market share of 4D printing stands at USD$ 28 million (Business Wire). According to MarketsandMarkets report, the 4D market is anticipated to rise to USD 537 million by the end of 2025. Another report by Fox34.com has it that the market will reach $185 Million by the end of 2022 which is the same figure projected by MarketsandMarkets research. 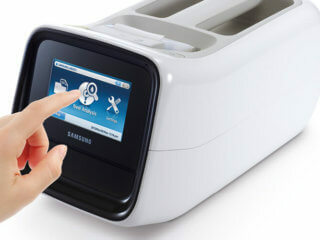 The primary contribution of Stratasys to 4D printing is the use of its Connex technology where it intends to make self-assembling 4D objects. In this practice, the -assembling materials are mixed with the standard contents. On the other side, Autodesk came up with Project Cyborg which is Autodesk software that facilitates simulation of 4D structures on the computer monitor. How does 4D printing differ from 3D printing? Developed in 1983 by Charles Hull, 3D technology has had a far-reaching effect especially in the field of aerospace. It is the process of engineering objects by compiling materials. 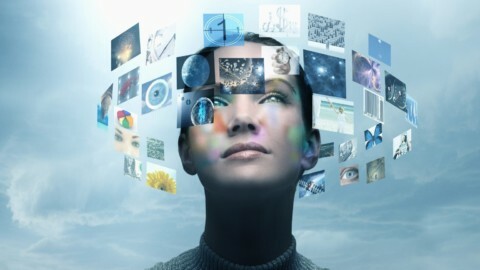 Though many research organisations looking to market their findings may portray to exist differences between 3D and 4D, according to Quora, there are no such much differences. We are just using 4D to explain 3D objects which are liable to change their orientation after the end of the printing procedure. MIT researchers were the first to use this, and you can get this from their web here: Self-Assembly Lab.The only difference is that 4D objects are more responsive to a myriad of purposes in which they will serve. 3D Printing doesn’t have a time element to it, therefore produces a static output. A variety of materials can be used in 3D printing, like UV curable resin, thermoplastic polymer, metal etc. On the other hand, 4D printing can only utilize those materials that are temperature responsive. However, the primary challenge we are likely to face in migrating to 4D printing is the large sums of money required for this transformation. Another problem is that this technology is yet to be tested in large-scale applications and therefore full realisation of 4D printing may as well remain mostly theoretical. 4D is poised to take things to great heights. Its applications are endless. Research by Monash University researchers found out that 4D printed products will produce equipment that will be responsive to body needs once ejected in the human body. 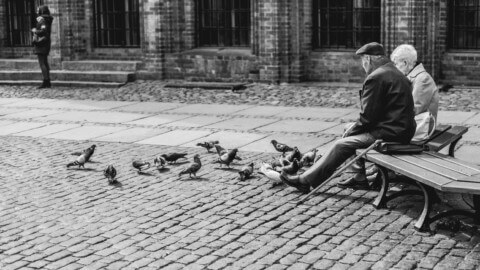 According to a study carried out by Frost and Sullivan, 4D printing technology is ultimately going to drive big transformation in the healthcare sector. 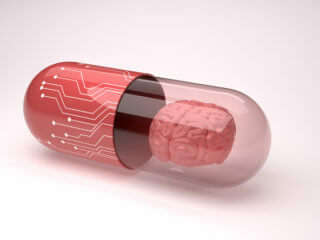 The applications range from creating artificial organs to adopting a nanotechnology. 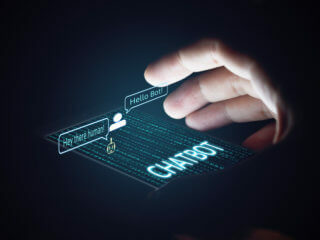 Similarly, the technology is expected to influence the following applications: self-assembling human scale biomaterials, nanorobots for chemotherapy, nanoparticles, and in tissue engineering. Though cost is anticipated to be a stumbling block, it is expected that the price will drop considerably as more players enter the market. 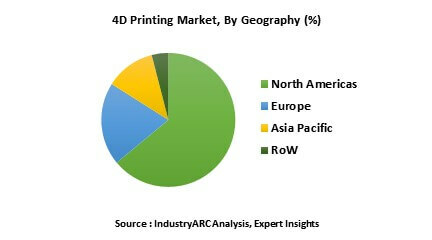 The chart below shows the geographical market in the use of 4D printing. There have been successful developments of 3D medical devices to 4D such as biomedical splints that can change and adapt their environment. Bioprinting devices, stents, and orthodontics are other examples of these developments. However, the most significant application of 4D printing has been in the medicine, and most controversial one dumped as “4D Printing in Medicine “The 4D Printing was planned to have an implant that when exposed to human growth will grow. Though there are numerous industries on the run to embrace 4D printing technology, the medical field hasn’t been left behind. However, according to Tibbits, he sees the pharmaceutical industry itself and its regulations as the only challenge to adopting this technology. He argues that 4D printing technology will be able to conform to the different situations with ease and precision, and therefore there is every need for the medical sector to act and utilise the 4D technology to enjoy these benefits. In conclusion, the possibilities for 4D printing technology are endless, and the potential impact is being seen in all sectors such as education, health, and manufacturing. Though 4D printing is mostly dependent on 3D printing, it has the capabilities of its material to change over time to conform to the environment. 4D printing will surely bring unimaginable skills in such fields which for a long time has remained very inelastic, such as in building industry, aerospace, health and in automotive. From 1D printing to 2D printing, to 3D printing, to 4D printing technology, the world is expecting prodigious revolutions exclusively that will come with 5D printing. It is supposed to use magnetic fields during the unit orientation process.